will help your child or classroom discover easy patterns for tables 1-10. Patterns enhance recall. Designed for Grades 2 -4, this innovative workbook can be used as a primary or supplemental text in the classroom, homeschool or with special needs children. 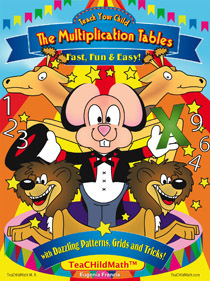 Teachers: Teach Your Child the Multiplication Tables brings the magic of math into the classroom. Parents: Use Teach Your Child the Multiplication Tables to give your child a head start in math, homeschool or supplement classroom instruction. TeaCHildMath is seeking strategic partners in the U.S. and publishers in Mexico, the EU, Australia, Japan & Korea. Please e-mail using the Contact form on this website. School or Charitiy Fundraisers: If you would like TeaCHildMathtm products for fundraisers, please e-mail using the Contact form on this website. TeaCHildMath is a registered trademark in Mexico, the EU, Australia & Korea.